Posted on January 18, 2015 by Michele D.
We recently discovered that our picky-eating 8 year old daughter, who eats almost nothing, was a fan of cheese tortellini with alfredo sauce. We ordered the dish at a non-Kosher restaurant, offered her a bite and she ended up eating the entire thing. She then begged me to make alfredo sauce for her at home. As some of you might remember, I’m currently without a kitchen due to a remodeling project so the last thing I wanted to tackle was a homemade version of alfredo sauce. Forget about the fact that I’d have to balance a sauce pan on my single electric burner. The thought of cleaning up that mess afterwards with the garden hose in the backyard just didn’t appeal to me at all. 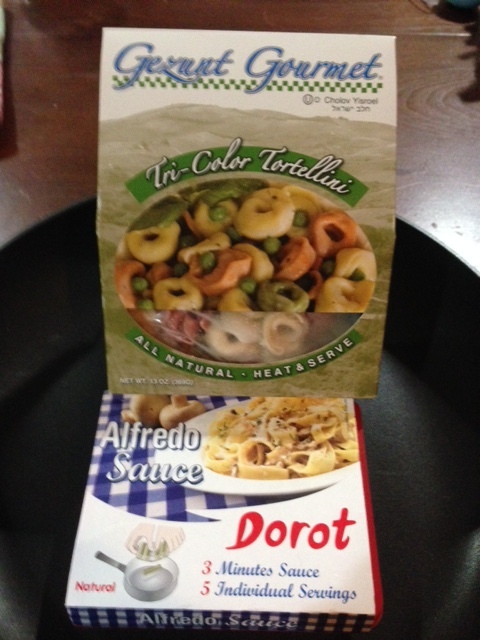 So I went on a mission to find a pre-made, kosher version of tortellini and alfredo sauce. I’ve ordered kosher cheese tortellini before from the KC Kosher Coop, but I’ve never seen pre-made kosher alfredo sauce. During my next trip to the local Tom Thumb store, I started searching the aisle of canned (Jar) food to see if there was an alfredo option similar to the versions of pre-made spaghetti sauce. I found lots of options but none were kosher. Next I checked the freezer section and struck cheesy gold goodness: Gezunt Gourmet Tri-Color Tortellini (heat and serve) and Dorot Alfredo Sauce. I bought both immediately and planned to make them for dinner the next night. But … when I started making dinner the next night, I realized that the Alfredo Sauce required a few more ingredients, ones that I did not have. The frozen package includes 5 individual frozen strips of a mushroom sauce base (1 strip = 1 serving) that you have to mix with milk and heavy cream in a sauce pan, bring to a boil and add spices to taste. It sounded delicious and easy, but I had no heavy cream on hand so I made the tortellini and served it with a red spaghetti sauce instead. My daughter liked it but not as much as if the pasta was covered with alfredo sauce. Since then, I’ve purchased heavy cream and will attempt the alfredo sauce sometime this week. Stay tuned for the outcome. What about you? Do you have suggestions for easy-to-make kosher alfredo sauce?